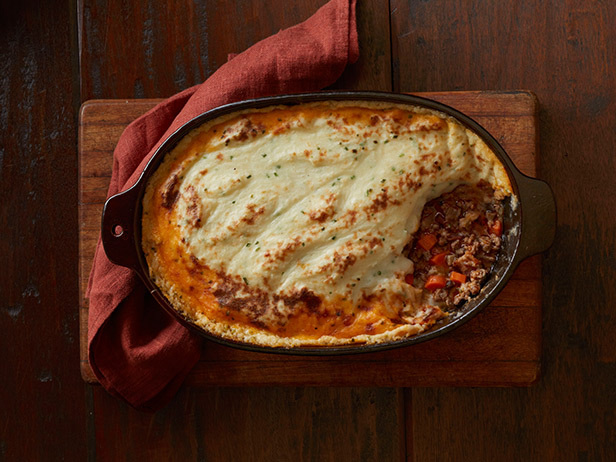 This is a light twist on the traditional Shepherd’s pie recipe. There isn’t any corn in this one…some of us can’t digest it 😉 I love corn but corn hates me. Also, there’s bacon in it – lovely gorgeous bacon. If that and the parmesan potatoes hasn’t sold you on this yet – nothing will. I made this the other night for dinner and loved it. The buttery, chive and parmesan mashed potato topping was the absolute best part of it; rich tasting and crispy…so good that I had it for dinner, then lunch and then dinner the following night because my husband wasn’t going to be home. Mind you that’s also because I was too lazy to make something different at the time, but I was happy about it. My husband despises shepherd’s pie – aka pâté chinois. He says he ate too much of it growing up. However, he said he liked this version and would agree to eat it again….”but I won’t be thrilled” he said, almost like he was betraying a core belief . In any case, its Progress. He eats almost anything with only a few restrictions. He doesn’t like when foods are mixed, like a pâté chinois, and doesn’t like loose minced meat. Its like he was traumatized or something. lol So, no sloppy Joe, no tourtiere and no shepherd’s pie and for heaven’s sake…NO cabbage rolls! If you have a mini-food processor, it will make this recipe a heck of a lot faster to prepare. I love that thing 🙂 If you don’t have one, they aren’t pricey and they don’t take up a lot of room. You won’t know how you lived without it. I only had dried thyme and it was fine but I imagine fresh would have been the best. As for the mushrooms, I used a lot less , like 1 oz. I had a small package that I just chopped up finely. Don’t forget the ketchup. I love my pie with ketchup! Prepare the topping: Put the potatoes in a large pot and cover with cold, salted water. Bring to a boil and cook until tender, about 25 minutes; drain, reserving the pot. Meanwhile, make the filling: Cook the bacon in a large skillet over medium heat, stirring occasionally, until crisp, about 10 minutes. Drain all but 1 tablespoon of the fat; add the beef to the skillet and cook, stirring occasionally, until browned, about 4 minutes. Add the onion, carrots and celery and cook, stirring, until the vegetables begin to soften, about 4 minutes. Add the mushrooms, thyme and tomato paste and cook, stirring occasionally, until incorporated, about 3 minutes. Preheat the oven to 375 degrees F. Finish the topping: Combine the butter and milk in the reserved pot and cook over medium heat until the butter is melted. Return the potatoes to the pot and mash with a potato masher or wooden spoon until smooth. Stir in the parmesan and chives. Taste and season with salt and pepper as needed. Transfer the filling to a 2 1/2-quart baking dish and cover with the topping, spreading evenly. Bake (uncovered) until the topping is golden, about 35 minutes. Let rest 15 minutes before serving.